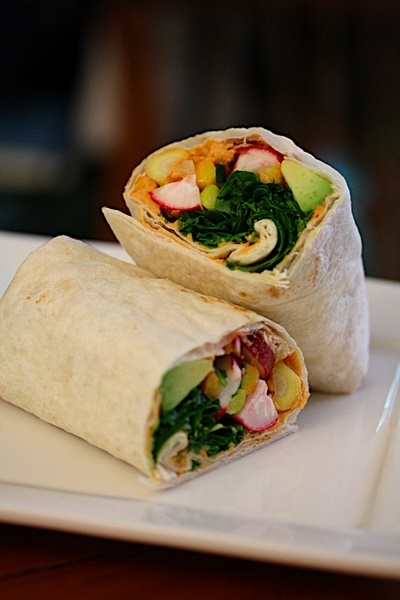 We offer to you to try this 3 Perfect Brown Bag Lunches. Cara here from Big Girls, Small Kitchen. I’m going to be honest with you: I struggle with lunch. While I crave something satisfying midday, I also don’t have time to submit to a case of the afternoon snoozes. Whether or not you’re actually headed back to school in the next month, late summer and early fall are the times to get in good habits, and that includes lunch. In these three recipes, I try to perfect the art ofpacking a brown bag for school or for work. 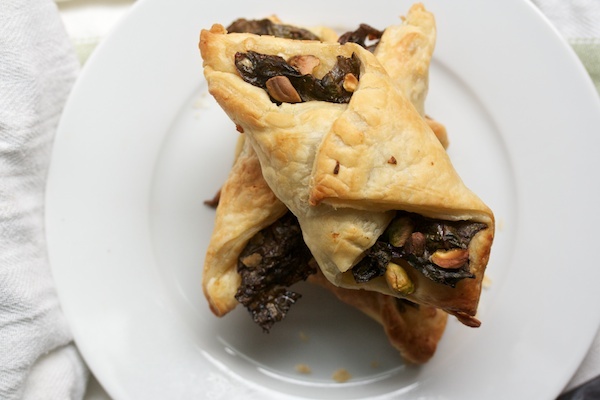 These delicate-looking pastries are actually packed with healthy goodness: fresh greens, savory Parmesan, and protein-rich nuts. The purchased puff pastry also makes these easy to put together. Though they’re delicious out of the oven, they make a great little lunch or snack at room temperature. Pack two, plus some carrot or cucumber sticks. Depending on what looks good, you can also use spinach, kale, or mustard greens in place of the chard. Plus, sub in walnuts or pecans for the pistachios if those are easier for you to find. Preheat the oven to 400°F. In a medium mixing bowl, combine the minced garlic, lemon juice, mustard, Parm, olive oil, and pepper. Stir well. 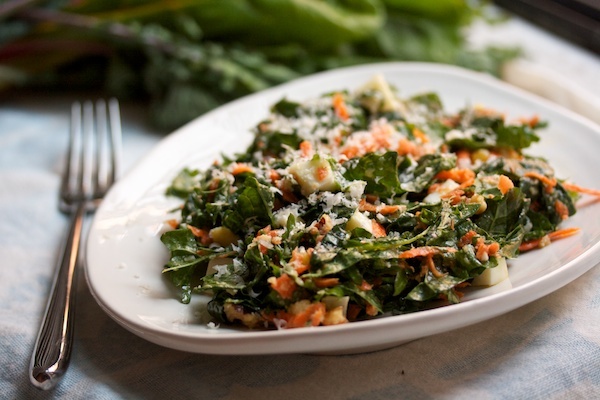 Add the chard leaves and toss with the dressing to coat each piece generously. Take out one sheet of puff pastry and unfold it. If it’s uneven, use a rolling pin to shape into an even rectangle, but don’t roll it too thin. Use a paring knife to cut the sheet into 6 rectangles. Take one rectangle, and rotate it 45 degrees so it looks like a diamond. Pull out the two sides of the diamond, and layer on 3 pieces of chard, overlapping them, from the top point down to the bottom. Sprinkle on a couple of the chopped pistachios. Now, fold the side points of the diamond–the ones you stretched out a little–over the filling until they overlap about an inch. Press them down. It’s okay if it looks a little messy–as it cooks and puffs up, it’ll look fine. Using a spatula, transfer the turnover to a parchment-lined baking sheet. Repeat with the rest of the dough until you have 12 turnovers. Bake them for 15 minutes, until puffed and golden. Cool for 3-4 minutes on the baking sheet, then serve. These also taste great room temperature and are easily reheated in the microwave. In a small mixing bowl, gently mash the avocado with 3/4 of the lemon juice and 1/4 teaspoon of salt. On a work surface, spread a large spoonful of hummus over half of a tortilla. Spread a spoonful of the avocado mixture over the other half. Place a handful of carrot sticks in the center, top with a sprinkle of radishes, and 1/4 cup of arugula leaves. Fold in the top and bottom sides of the tortilla. Fold in one of the sides length-wise and roll the tortilla, making sure the top and bottom stay tucked. Repeat with the remaining tortillas. This salad is so typical of the way that I eat. Here’s my pattern: I take an ingredient that’s unequivocally healthful and use it as my canvas. In this case, that canvas is kale. Then, not wanting myself to feel deprived in the least, I throw in tons of rich, yet healthful ingredients. Here, that’s egg, avocado, and vinaigrette. As I eat, I savor the heart-healthy fats at the same time that I enjoy (really!) the nutritious kale. So far, this is a pretty good pattern for me. I hope you like it too! Place the kale in a bowl. Massage a few pinches of salt into the greens. Set aside while you do everything else. Once you’ve grated the carrots, boiled and peeled and chopped the egg, grated the Parm, chopped the walnuts, and diced the avocado, add all these ingredients to the bowl. In a second bowl, whisk together the vinegar and mustard. Slowly drizzle in the olive oil, whisking as you go to emulsify the dressing. Add the honey and a pinch of salt. Pour most of the dressing over the salad and toss to mix it in with all the ingredients. Taste for salt. Add more dressing if you like. Eat now or pack up and eat later.